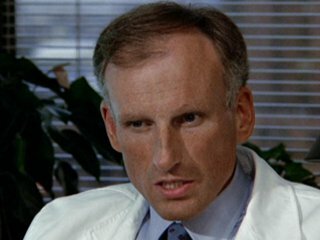 Rarely the lead; usually a guest; embodies either the saint, or the devil; appears everywhere at once: such is the definition of a working character actor, which James Rebhorn was throughout a laudable career that unfolded mostly on television, though he had his moments on the big screen too (The Talented Mr. Ripley as Matt Damon’s father, Basic Instinct, Shadows and Fog, Silkwood). More recently, he was Frank Mathison, the father of Claire Danes’ character on Homeland. My favorite memory of him, though, is on the New York stage. As a young actor, one of the first plays I saw upon my arrival was Are You Now or Have You Ever Been, a fascinating distillation of the House Un-American Activities trials; Rebhorn, in a variety of roles, was alternately moving, acerbic and precise: a model of everything I aspired to. He played Doctor Gibbs in Lincoln Center’s stunning 1988 revival of Thornton Wilder’s Our Town; in a cast populated by the likes of Sada Thompson, Frances Conroy, Eric Stoltz and Penelope Ann Miller, Rebhorn made his mark as a member of the large ensemble without flash, but with a realness that still makes me flush when I think on that night. RIP.